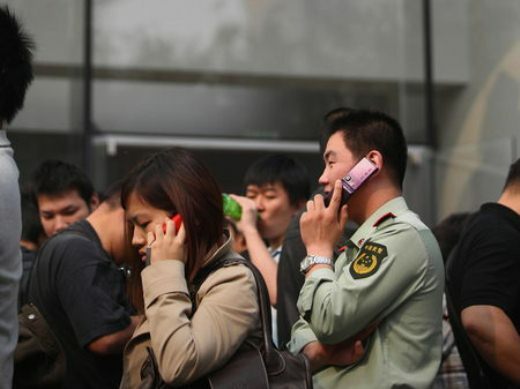 Numbers don’t lie: more and more Chinese are disconnecting fixed-line telephones and turning to cell phones for communication, according to statistics released by the Ministry of Industry and Information Technology (MIIT). China Daily reports that China’s mobile telecommunication operators added 19.83 million new subscribers in the first two months of this year, bringing the number of the country’s cell phone users to 878.83 million. Fixed-line telecommunication companies lost 918,000 users in the same period. For a highly populated country, fixed-line subscribers in China has an impressive 87 percent penetration rate: 1.17 billion telephone users compared to its population of 1.34 billion as of the end of February. It is however, starting to see a slow decline and this trend is expected to continue over the years. This still exceeds the 64.4 percent penetration for mobile phone subscribers, which conversely took a huge leap last year from 56.3 percent in 2009. Under the Five-Year Plan, the Chinese government along with China Telecom, the country’s state-owned telecommunications operator, will focus heavily on developing the telecommunications infrastructure, with total investments reaching 2 trillion yuan (roughly $300 billion). This happened amidst the unconfirmed controversy earlier this month that the Chinese government is looking into monitoring the movement cellphone users in China by tracking the signal of their mobile devices. The entire telecommunication industry generated 170.33 billion yuan ($25.97 billion) in business revenue in January-February, up 14 percent year on year.